Klean-Pop Shower answers the growing need for a quality, mobile decontamination shower that is inexpensive, durable and easy-to-use. The Klean-Pop shower offers the easy mobility and compact appearance of a suitcase on wheels. One person can move Klean-Pop wherever it needs to be and set up the shower in as little as two minutes. Compact When Collapsed: Easy and efficient transport and storage. 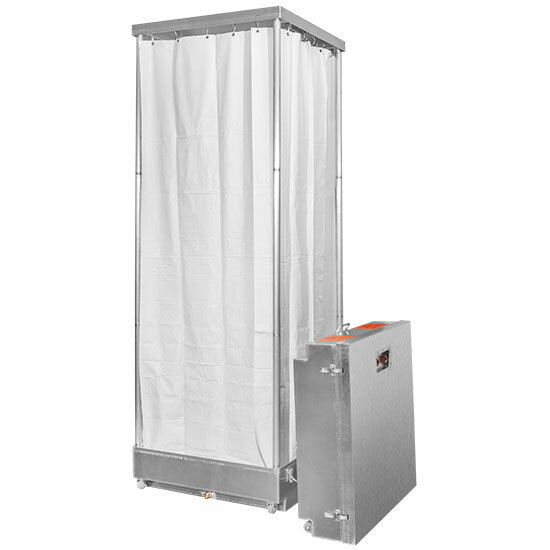 Occupies less space in truck or warehouse than conventional telescoping shower designs. Inset Wheels, Built in Handle & Lightweight Design: As portable as a suitcase. Easy for one person to move from place to place. Set-back wheel design makes stacking for storage or transport easy. Lighter than conventional telescoping shower designs. Rugged Aluminum Construction: Rigid and durable when assembled. Unique Set-Up Design: One person set-up in as little as two minutes. Two curtains with rings already mounted on ceiling rods for privacy. Curtains are easily changed or removed when desired, and replacements are available. All-Brass, Strategically-Located Mixing Valve: Quality durable fixture designed to last; mount on ceiling so equipment can be moved through decon. Place Shower Base (A) on floor. Insert assembled support pole into shower base corner socket. Repeat steps 2 and 3 for the remaining three support poles. Screw Shower head (E) onto the underside of Shower Top (B). Place Shower Top (B) over support poles. Attach Shower Curtain (C) to Shower Top (B) using Shower Curtain Rings (D). Attach water supply hose to threaded fixture on Shower Top (B).